Over the past few months, we have been advocating a cautious stance to the dominant bullish trend in US equities. A recent report, titled “US Equities S&P500 Encountering Increased Technical Headwinds” was published on 15 November. In this short piece, we highlight several factors which could begin to weigh on the current bullish sentiment as prices cross the 2600 threshold. These include a stabilising VIX – traditionally stocks fall as the VIX rallies – and a potentially terminating 5th wave, as counted from the base of the 2007-2009 Financial Crisis. 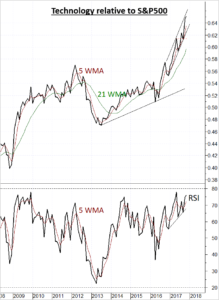 We also believe US equities will find fresh headwinds due to both Sector and Cross Asset rotation. 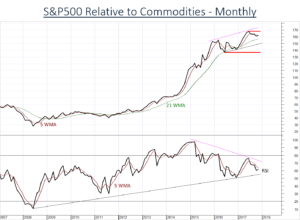 We recently updated our “US Sectors relative to S&P500” monthly publication. The full report looks at how 12 major US sectors are performing relative to the S&P500 Index. 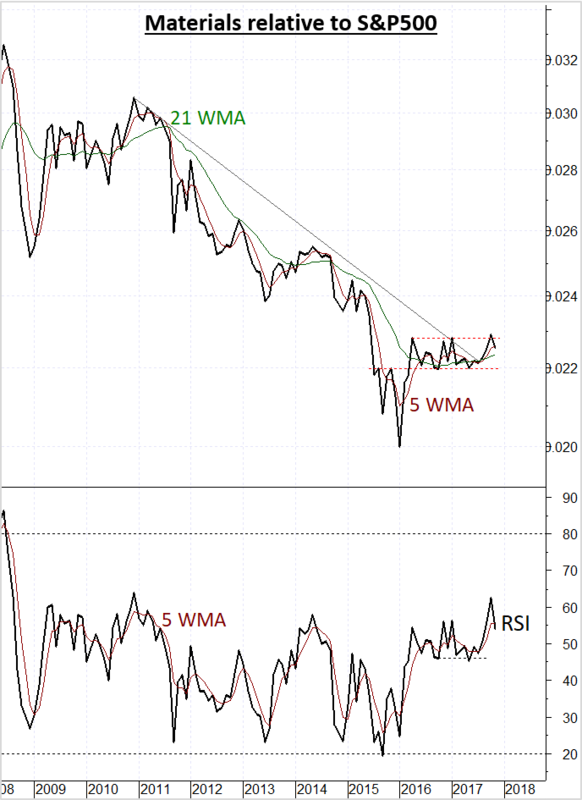 There have been several upgrades, eg Consumer Discretionary, Consumer Staples and Real Estate. However, whilst investor sentiment would seem to be improving in these areas, the charts suggest price action is more defensive, rather than impulsive. The respective underlying trends remain negative, and their bounces have done little to change this. The strongest sectors are Materials and Technology (XLK). The Materials sector is trapped in a broad range. A close above the range highs is needed to improve investor sentiment and point to fresh Outperformance into the coming months. However, a closer look at the 124 component stocks shows just over 30% are themselves Outperforming the broad S&P500 index. 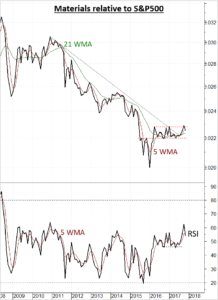 This lack of breadth suggests the Materials sector could find difficulty sustaining any immediate break higher. The Technology sector, however, continues to extend its strong Outperformance. Prices are trading at multi-year highs, but we are cautious of further strength into the coming months. 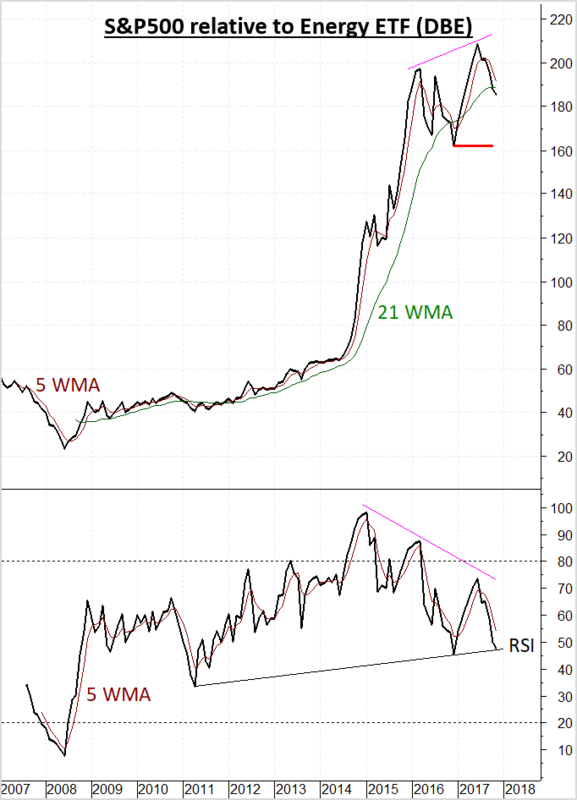 Our recent report, “US Technology Sector (XLK) Outperforming…”, highlights why we are maintaining a close watch. 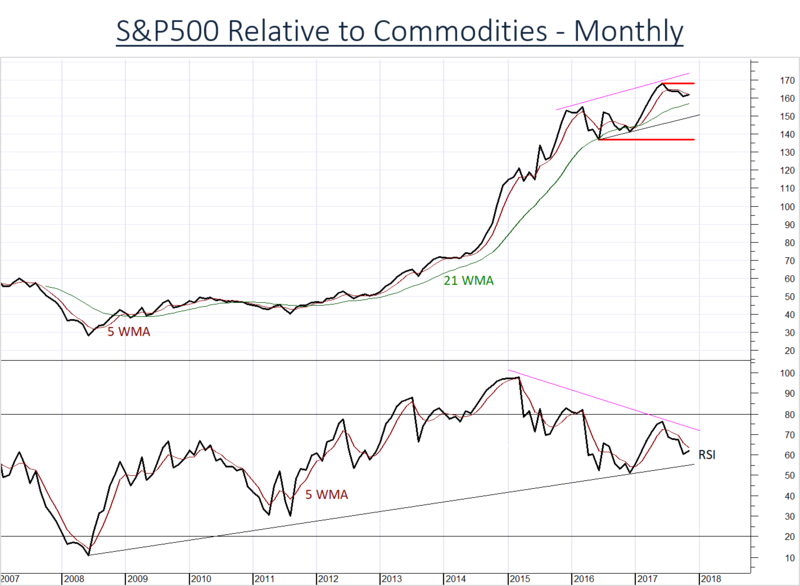 Our recently updated “S&P500 relative to Commodities” monthly publication also highlights potential warning signals. 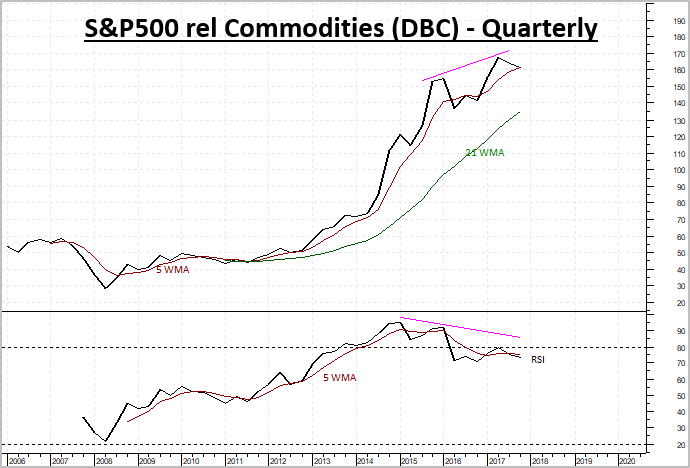 US equities are showing fresh weakness relative to the broad Commodities space. The S&P500 Index has been downgraded to Underperform. 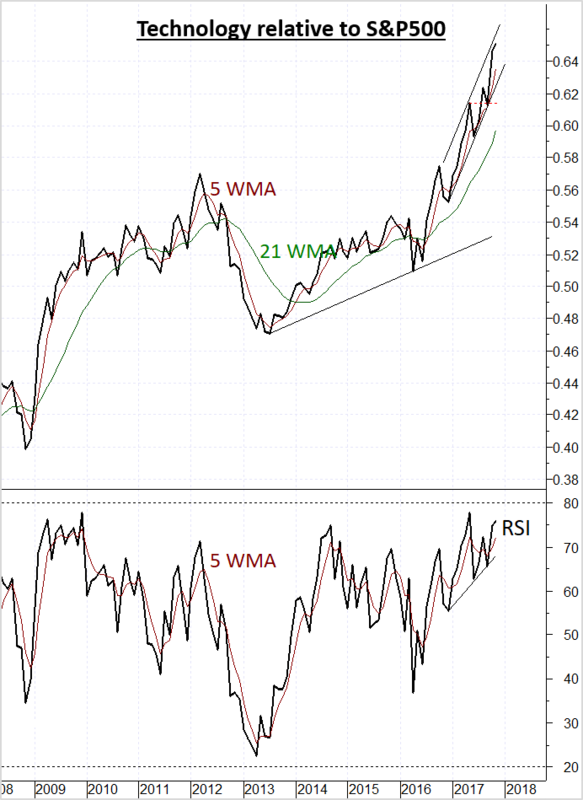 We anticipate further weakness into the coming months as momentum studies also break down and negative divergence unwinds. 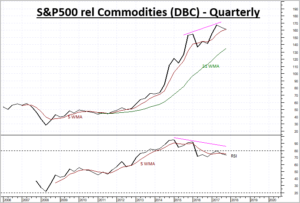 Taking a further step back from the monthly charts, and looking at the longer-term Quarterly, or 3-month, charts, we can see signs of equity weakness developing relative to the broad commodities space. As USD funds move out of equities and into commodities, we believe this will weigh on equity sentiment into early 2018Q1. Investors will see progressively more opportunities in the commodities space and commodities based instruments, and less value in equities. We anticipate US equities will come under fresh selling pressure in the coming months. Sector rotation will promote a more selective approach to stock picks. 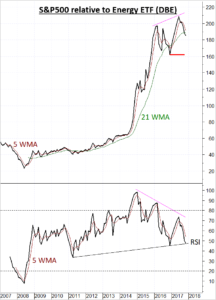 Weakness of US equities relative to Commodities will also provide opportunities for USD based money managers to rebalance their portfolios.